I love Gorey, and before seeing this show I never quite realized that he worked in actual size... so if you've seen his wee books, the true drawings are carbon copy. I wish they would've included some of his pens... it's mind blowing to imagine someone working with such tiny lines and not losing their marbles. 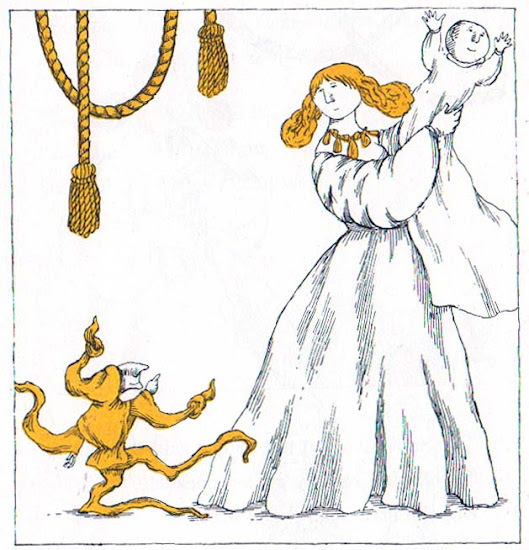 Now, the catalogue for the show mentions that Gorey often attempted to sell his books to publishers as children's books, but editors collectively thought his concepts to be far too esoteric for children. Thus, why the bulk of his work for children was actually authored by someone else. As I've mentioned before, I've just recently begun digging up these titles, and despite the protective nature of his editors, they still all seem wonderfully spooky to me. 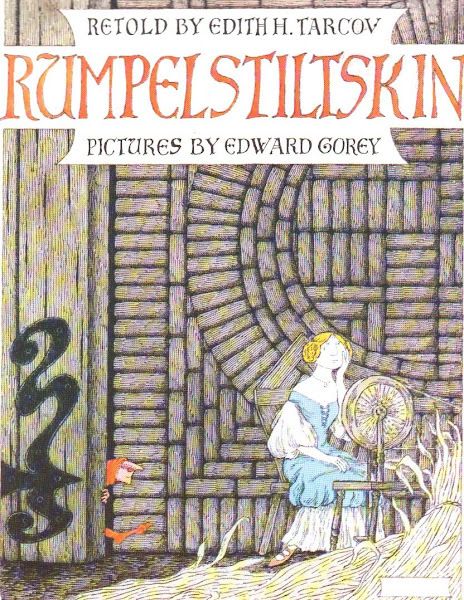 Granted in this case, I find it near impossible for anyone to do Rumpelstiltskin without it being creepy. The title character himself even in words is pretty ick... a little troll-like man... a baby snatcher... shoot, my son even squirms at the Muppet version we have on VHS. Tonight my cakes I bake. Tonight my beer I make. The queen's little baby I take. For Rumpelstiltskin is my name. Thus ending what can only be a horrible nightmare for the queen. Imagine, having to give your child to a horrible dwarf who will do god knows what with him. Gives me the heebie jeebies just thinking about it. 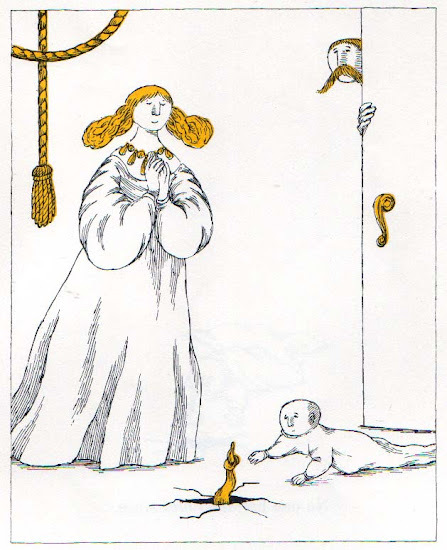 All the same, we do need to sprinkle a little controlled terror into our children's lives every now and again, and the illustrations here are impeccable. Really, if you are within a hundred miles of San Antonio between now and September, do yourself a favor and check the show out. Total genius that man, and to get so close to his stuff is a true honor. awesome! i love those connections! I had this book as a child. What is not mentioned here is the fact the book came with a record, with voice actors reading the dialogue. Rumplestilskin has a wonderful high pitched, yet gravelly voice. Listening to him singing the song shown in the article is quite memorable. I also pity the poor messenger, who has to search through the kingdom trying to find every name he can. 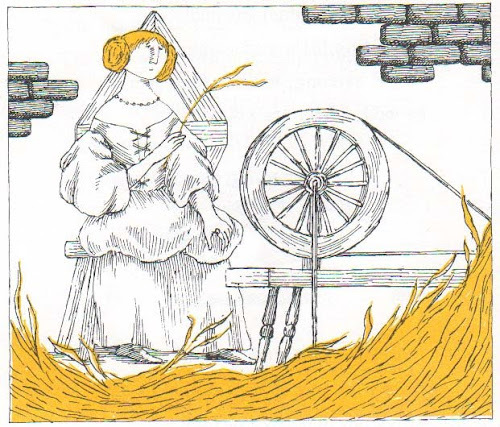 I know it has little to do with the art of our creepy, and much welcomed, good friend , Mister Gorey, but the record along with the pictures made this a most beloved book from when I was little.